When I was in college I barely cooked. I lived with my brother who, especially back then, didn’t like to eat much. We pretty much lived on fast food and Doritos. But Upma was one of few things I did cooked back then, since it was fast, easy and one of the few things he would eat. 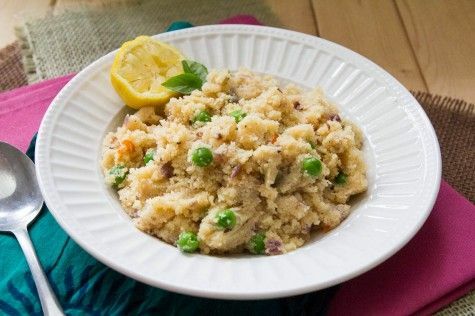 When I was younger, my mom always made Upma. She didn’t like us eating sugary breakfast cereals in the mornings, she would insist we eat something warm and filling instead. Or as she would say, a “hot breakfast” or “hot snack.” We often had upma along with a hot cup of chai for breakfast. So yummy! We didn’t just have upma for breakfast. My mom often made it for my brother and me when we complained of being hungry in between meals. 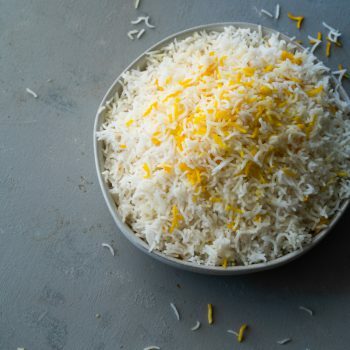 It doesn’t require a lot of ingredients and is ready in 15 minutes. Now that I cook a lot of “real” food, I still make upma pretty regularly. It’s one of those foods that I cook when the foods in my pantry are running low. All it takes is a little semolina (basically Cream of Wheat), onions and frozen peas. So simple! 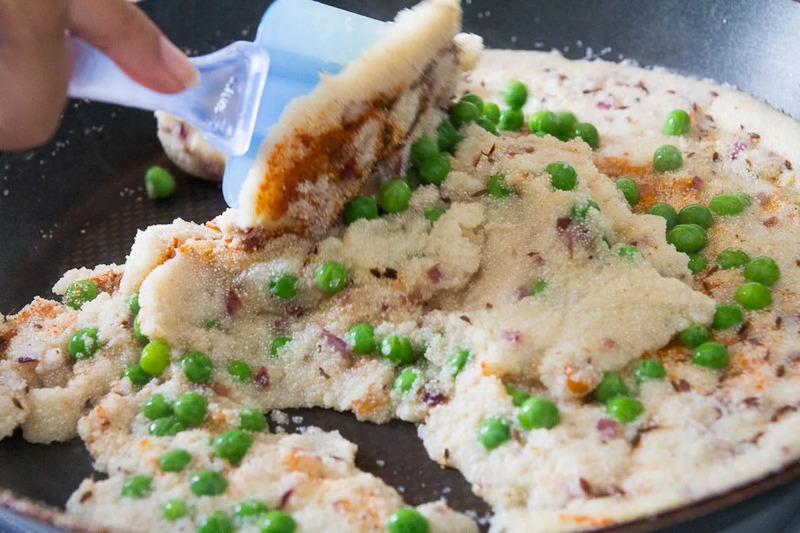 If you’re like us and have a hard time coming up with breakfast ideas that are both vegan and savory. 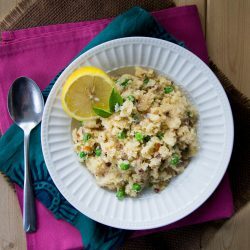 You have to try upma. Heat oil in a 12 inch wide skillet over medium heat. 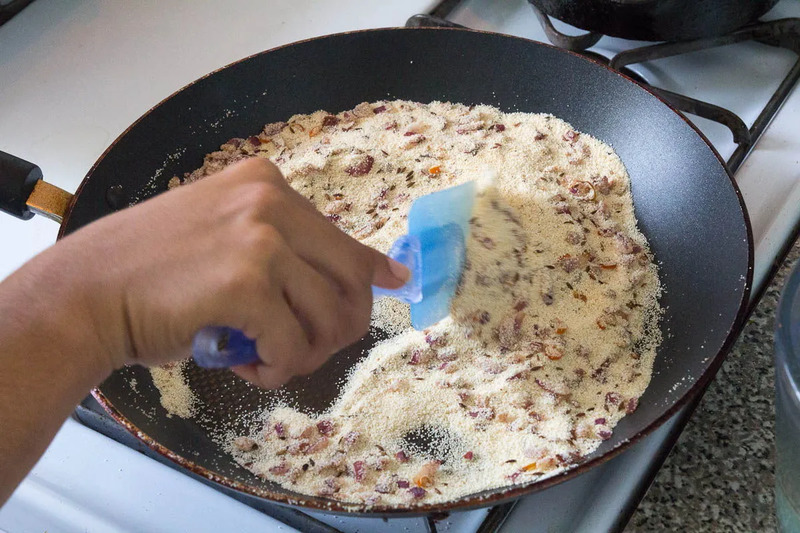 When the oil begins to shimmer, toss in the cumin seeds. Let cook for about 10 seconds. Add the onion and green chili with a pinch of salt. Saute the onions until they are soft and translucent. Add the semolina. Dry roast the semolina, stirring constantly, until it becomes fragrant and smells toasty. About 5 to 7 minutes. Add the water, peas, chili powder, and salt. Stir. Let cook for 3 to 4 minutes until all the water is absorbed. Feel free to add turmeric or some toasted nuts if you want. 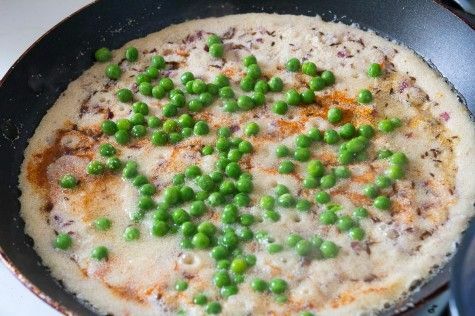 Comments on "Savory Cream of Wheat with Onions and Peas (Upma)"
My older brother learned how to make this when he was 8, and ever after, he'd make some for himself and for me with sugar and butter, instead of vegetables, herbs, and spices. 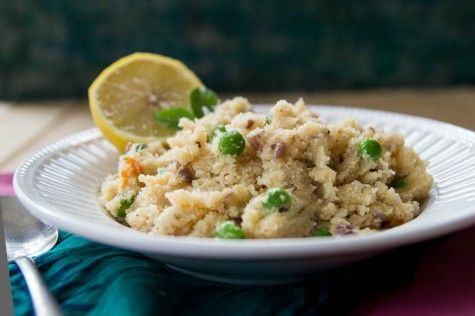 My mom still made upma the usual way, but it should go without saying that I loved the sweet version much more than the savory. It's been years since I've made some though. I think I'll try it for a snack later this afternoon. Such a beautiful and surely wonderfully tasty idea! With the kind of pancake stadium in the middle which is then later fluffed, it reminds me a bit of Austrian Kaiserschmarrn which is done similarly. 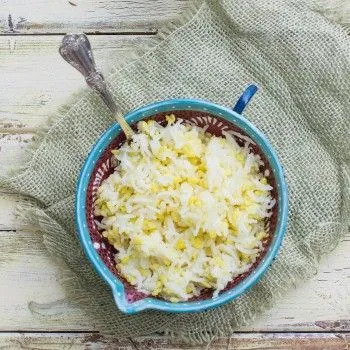 It's so astonishing how close the different cuisines in the world are sometimes connected. You're right. I am always amazed at how similar foods from the opposite sides of the world can be. I've never had the Austrian Kaiserschmarrn but I'm looking at recipes online and they look really yummy! Hi Puja! I just wanted to thank you for this. It was one of my favorite meals while in India. I'm having a bowl now thanks to you! I used whole wheat semolina since I'm out of the regular. Still delish!! Tha k you! Can’t tell you how much I was craving upma lately after days of eggs and toast! 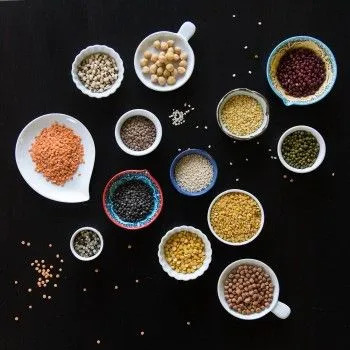 I was seriously discouraged because I knew I won’t be searching for the ingredients and where to find them in Los Angeles... thank god for your cream of wheat upma recipe!!! cravings satisfied with ingredients from target ?